Modern Dance in Los Angeles. Tonight we celebrate the lifetime of artistic achievement of Rudy Perez. 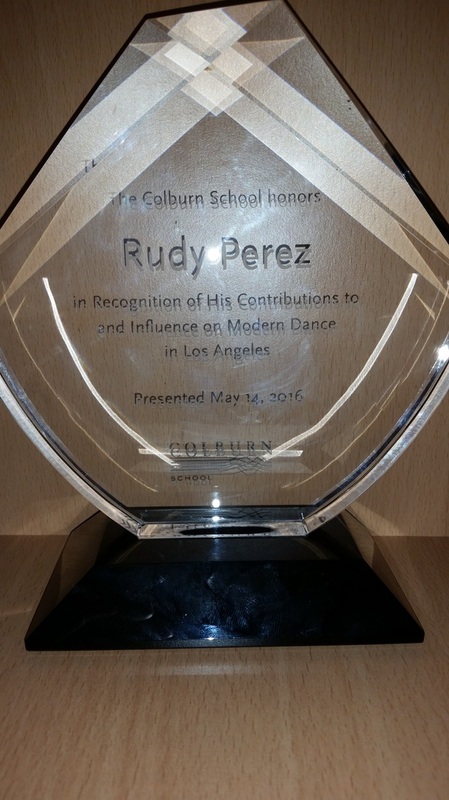 It’s a great pleasure and honor to tell you a bit about Rudy and, to present a special award to him following the performance. It’s deliciously appropriate to the sly, subversive wit of Rudy and the artistic scene in which he developed, that he should be represented tonight by a work called Cheap Imitation, for it is neither. Instead, the familiar is reconceived through the workings of a very original mind. I first saw that original mind in action at UCLA’s Royce Hall in 1971. He and his company were on tour and I was a grad student in dance there. In his work I saw spare, sculpted, compressed essences of motion and emotion. I knew immediately it was the kind of work that I wanted to do. In 1976, when I moved to New York and saw that Rudy was teaching, I headed straight for his class and soon joined his company. I returned to LA in 1977 and Rudy arrived a year later for a residency at UCLA and never left. And 37 years later he has created a body of over 50 works that have contributed to raising the bar for dance in Los Angeles. He has always sought excellence for his dancers and in his collaborations with LA composers, visual artists, designers and writers. Rudy’s first works appeared in the 1960s. Yah, the Sixties, that era of social and cultural experimentation – of Bob Dylan, Andy Warhol, Robert Rauschenberg and Jasper Johns. As well, a group of dancers started showing work at the Judson Church down in New York’s East Village, and Rudy was one of them. They were experimenting and pushing the envelope of what could be dance. Could it be everyday movement, like walking, running, sitting or standing performed at various speeds for various periods of time and in unlikely places? Or, to give examples from Rudy’s own early solos, could it be tasks like moving chairs or measuring a distance and laying tape along it while wearing a hard hat and coveralls? Could you make dances out of a few ordinary gestures, as Rudy did, like smoking a real cigarette in one work, putting an imaginary one out in another, audibly blowing a kiss sharply off one’s upward palm, or ever so slowly with eyes closed, bringing one’s fingers from lips into the air. The Judson Church Group was exciting to its early audience of artists, performers and the church members who were game for anything new. Between them, the borders of dance were expanded. This did not always go over so well with the traditional dance audience or some of the critics. New York Times reviewer Clive Barnes wrote that what Rudy did was not dance, but, he had to concede, you had to be a dancer to do it. And that is a very important point. In Cheap Imitation, I see another question. How can simple moves from popular dance, folk dance and ballet be put together in one work without clashing? And not only that, but look organic together and equal in importance? For Rudy is a totally equal-opportunity employer of everything, and influenced by his great and ongoing curiosity in, well, just about everything. He absorbs it all to create work that can be thought-provoking, suggesting through unlikely juxtapositions, glimmers of feelings and worlds simmering beneath any surface, or, as we’ll soon see, fun in dances filled with movement that generates more movement forming and re-forming into endless kaleidoscopic designs. … Abstract and poetic. … And timeless. Cheap Imitation, like all of his work, looks as fresh as it did at its 1983 premier – a mere 33 years ago! That was at the John Anson Ford Amphitheater as part of the former annual summer series, Dance Kaleidoscope. The music is by Glenn Branca. The original lighting designer was Chip Largeman with costumes by Susan Perry Miick. The original cast of 7 were Ian Cosineau, Dura Snodgrass, Quentin Josephy, Melinda Ring, James Kelly, Kim Kimberly and David Leahy. Except for Ian and Quentin, the dancers came from his repertory class at Cal State Long Beach. Tamsin Carlson, has beautifully restaged it and seamlessly made it a work for 11 dancers. I want to end by quoting Doris Rudko, who taught choreography at Julliard for 2 decades and who knew Rudy. When I told her I was dancing with his company, she said, “no matter what Rudy does, he is always an artist.” I couldn’t agree more.